Those eyes seemed to challenge me from the bookshelf for more than a year. “Come pick me up, if you dare,” she taunted each time I picked it up. Her lips curled into a cynical smile as I kept it back, once again. I pretended that I was not yet ready, that the time to listen to her story had not come, yet. For I knew, she would demand undivided attention once she started her tale. And then, when that stare became unbearable, I picked it up again and flipped it open. So started a journey that I am powerless to even imagine, from Somalia to Saudi Arabia, Kenya to The Netherlands and finally to that land where milk and honey flows and people, even women are allowed to speak their mind without fear and inhibitions, the US of A. 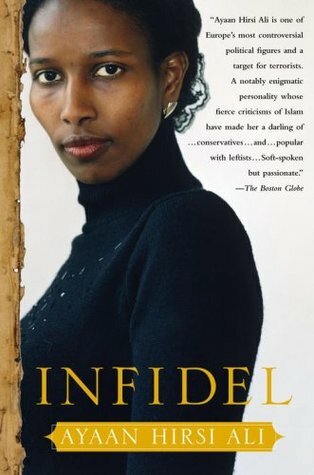 Brought up mostly by her mother and grandmother, Ayaan begins her tale in a typical Somalian village, that was yet to see the deep valley of darkness that Islam could be, to a woman. Religion was a set tales for her, rather than a way of living. All that changes as the family is forced to move to a city, if you could call it that. Her parents are comparatively modern in their outlook, her father insists on both his daughters getting educated along with their brother. She gets her first taste of religious fanaticism, that of blindly following a tradition that is barbarous beyond belief, when her grandmother forcefully submits her and her sister to the age old custom of female circumcision. To ensure the chastity of women, the female genitalia is completely cut off, sometimes even carved out with a knife, the wound is then stitched back together, leaving a tiny hole for the ‘pee could trickle’ down – another proof of virginity. The scar that it leaves is more in her soul and intellect than in her body. And her sister’s life is forever mutilated, the emotional after effects follows her till death. I will leave the years in Kenya and back in Somalia for you to read and gape in open disbelief and horror. The happiness and sense of security that she feels on the return of her father soon comes to naught as he decides the man she should marry, in true Islam tradition. She has no choice, but to agree. The chosen man is from Canada and Ayaan makes the biggest and most daring decision of her life. En route to Canada, she disappears during a stopover in Germany and finds herself in the Netherlands. The second half of the book talks about her coming of age in the free environment, surrounded by a few Dutch citizens who stands by and guides her. The deeper she delves into the teachings of The Prophet, the more she is forced to distance herself from the religion that she was born and brought up into. The more public she is about her views, the more she is hated among her refugee community and among her own people back home. The story goes on to tell us about her transformation, how she becomes a Member of the Dutch Parliament and finally, how she is forced to leave a country that she has come to love better than her own. A mere review is too limited a platform to cover all the emotions and thoughts that pass through one’s mind while and after reading the book. She raises some very uncomfortable questions to the so called secularists who still consider Islam a ‘peaceful’ religion in its essence. Freed of the shackles that bound her all through life, she finally denounces the religion that once defined her. The consequences can be imagined. It reaches a point where she has to be guarded even in the privacy of her bedroom following the brutal murder of a friend, Theo van Gogh. He had to pay the price for standing by her without compromise and showing to the world what happens behind the closed doors of a typical Muslim family, be it in Somalia, Saudi Arabia,Turkey or The Netherlands. Even after almost a week, Ayaan refuses to leave me, and I don’t think she ever will, completely. I wonder what is it that prompted her to question the things that were accepted unequivocally by her family and friends. How she started and where she has reached now is something that is beyond the comprehension of an ordinary mind. Where does she get the courage to challenge a whole religion? It is even more intriguing given the fact that it was her sister who was the rebel in their younger days. What is truly inspirational is her commitment and dedication to a cause that she believes in, that of bringing out women like her and showing them that they too have a choice, to live life the way they want to. Many would say her views are biased. She makes no bones about it. She has seen the worst that her religion could do to her and other women. Even men, for that matter. You may not agree with her views completely. But she definitely induces you to question some of your own beliefs, irrespective of whether you are Christian, Hindu, Buddhist or Bahai. Born and brought up a staunch Catholic, I could easily relate to many a question hers. About after life, the fruits of chastity, how women were supposed to guard themselves all the time and a fierce God who was waiting to pounce upon me the moment I ‘sinned’. The definition of sin is a topic in itself. One of the most important and relevant issues that Ayaan raises is the integration of refugees into their current country of domicile. She starts by voicing her concerns mildly on the perils of allowing a special status to refugees, especially from Muslim countries and how the basic rights of a citizen could be violated right under the authority’s noses. It takes a huge effort with solid data in place for eyes to be shocked open. Her views and opinions are as relevant to the Netherlands as it is to any other country today. Sometime ago, there was a discussion in one of my favorite book groups on FB on the ‘one book that you would recommend to your friend.’ A friend of mine had recommended this, strongly. Now I understand why and I agree with her whole heartedly. If there is one book, every young person , especially a young woman absolutely must read, this is it. Without doubt. It forces you to question the beliefs that could even be the foundation of your very being. It pushes you out of your comfort zone and makes you think of what is really important to you and what should actually matter to you. It shows you how you can raise from your ashes and how a single woman can change the course of numerous lives. So many things that you take for granted suddenly falls into perspective and your soul starts questioning you, “what have you done with your life?” The answer does not come easily. Verdict : Go grab it and read! It might leave you disturbed for life. But then , it could also make you question some of your beliefs and show you the way.